During our trip, Claire and I try to vary our activities so we can experience the country as much as our limited schedule allows. We have visited both ancient ruins and modern Buddhist shrines, did a couple of hikes to better appreciate the splendour this country has to offer, soaking in the cultural knowledge whenever possible and now, a safari! Yes, with wind in our hair and a coating of red-sand dust all over us. 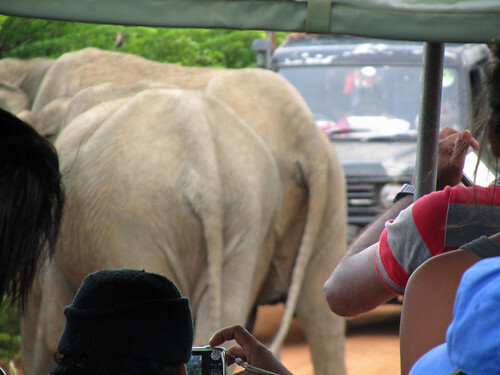 Now, the safari at Yala National Park is not to be equated to an African-style safari, with herds of animals running along the jeep. However, our hired 4×4 did zip around the ground, in search of the residents of the park including elephants, leopards (they were too far for me to photograph properly though), deers and macaques. We truly enjoyed this little outing, and had we had more time, we would have considered a full day safari, perhaps with an overnight stay in the park too. oooo i look forward to them! ps: is it me or is “safari” everywhere nowadays?